We’d love your help. Let us know what’s wrong with this preview of Twinchantment by Elise Allen. Uh-oh. Flissa reached up and checked. Sure enough, her hood had fallen off. Their secret was out. To ask other readers questions about Twinchantment, please sign up. That’s not a new idea. I have read books in the past that featured a magic-less world with characters trying to restore i I don’t remember the last time I gave a book a 2.5 rating but it feels appropriate in this case because this is a story that has a decent idea but a not-so-interesting execution. Content warning: Mention of death and war. I received this E-ARC via Disney Book Group and Netgalley in exchange for an honest review. I requested this awhile back and thought it sounded interesting. Unfortunately it wasn't for me. I found the prologue to be very info-dumpy. I didn't care for the plot, characters, or the world. So I decided to DNF. I still recommend. I'm sure others will enjoy it more. Thrilling tale of forbidden magic and adventure, with one of my favorite things ever: SIBLINGS THAT GET ALONG! Wooohoooo! That's right! Twins who are different, yet still love each other, and I am HERE FOR IT! Also, really clever magic system, plenty of intrigue, and some very different and engaging adventures, including killer grass and acid spitting dragons! This magical adventure features princess twins who must pretend that they are one person. What an incredible hook! I found this story engaging, fast-paced, intriguing and filled with mystery. THe sisters perfectly balance each other out in a w '"Let's not wait until a better way comes along--let's make a better way come along. Our Ascension Ceremony's next week, right? Once it's over, and we're officially in line for the throne, let's just tell the truth!" I love the twin-ness in this book! I have long been fascinated by twins, and this is such a unique, creative tale that appeals to not only middle-age readers, but their parents as well ;) Thank you, Disney for sending us this ARC--we love it! In a kingdom where magic is forbidden, the royal family is hiding a large secret: twins! Meet Flissara, the princess of Kaloon. Except, she's a little different than the other princesses: she's actually two different people! Twin princesses Flissa and Sara share everything: a birthday, a room, duties, and a life. 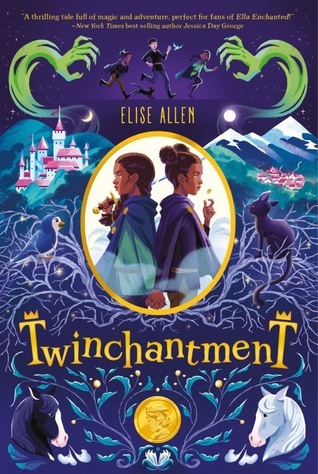 Due to superstition regarding twins and magic, they have spent their whole lives pretending to be one another and one pe I received an ARC from NetGalley in exchange for an honest review. Meet Flissara, the princess of Kaloon. Except, she's a little different than the other princesses: she's actually two different people! Twin princesses Flissa and Sara share everything: a birthday, a room, duties, and a life. Due to superstition regarding twins and magic, they have spent their whole lives pretending to be one another and one person. However, they couldn't be more different. Sara is artistic and messy and clumsy, and loves meeting new people and is the textbook definition of extrovert. Meanwhile, Flissa is athletic and loves studying and her horse, but hates being around other people and making decisions. As they approach their twelfth birthday, when Princess Flissara officially becomes recognized as the next ruler, the girls can't help but wonder what the future will be like for them and their double life. But when their mother suddenly becomes ill, and all signs point to the return of a banished dark mage, the girls know they have to track him down and force him to reverse the curse. Can they do so in time to save their mother? A delightful book about twins, who for 11 years have tried to be one person, that discovery the truth about many things ... themselves, magic and the history of their country. It's a refreshing look at the bonds of identical twins as they go on their first adventure together. I look forward to the continuation of their story. Once upon a time in a kingdom far away, a royal family ruled in fairness and light...until one day they were betrayed by the very magic they held dear, leaving them a scarred version of their former selves. To protect themselves from future attacks, declarations were made, rules created, and measures taken to remove all that could potentially hold the power to create chaos once again...or so they thought. First, keeping the girls straight is actually more of a challenge than I at first thought.. Once upon a time in a kingdom far away, a royal family ruled in fairness and light...until one day they were betrayed by the very magic they held dear, leaving them a scarred version of their former selves. To protect themselves from future attacks, declarations were made, rules created, and measures taken to remove all that could potentially hold the power to create chaos once again...or so they thought. First, keeping the girls straight is actually more of a challenge than I at first thought...guess they were rather good at playing their particular "role"! Second, the surprise twist towards the end when things are unraveling...STUNNER! I mean don't get me wrong, there is much to get caught up in along the way, including the brambles, the spells, and hungry sections of earth that simply gobble up those standing above (*gulp*), but the twists really kept you guessing! Third, can I just say I loved Nitpick! I mean the others are great, people and animal wise, and seriously the horse in the Twists is awesome and totally merits mentioning, but he's more than he seems without being SO much more! In the end, all I can say is BOY was that a rush! Really and truly, it's one of the good ones, and with messages of inclusion, the power of friendship, and with reminders to not always take things at face value, and always be yourself, it's a great addition to kiddos reading lists as well as those upward in years. I received an ARC from my local library. I picked it up because this was the type of book that I loved to read when I was younger. Overall it was very cute, but I just couldn't get into the story. I felt like I was almost all the way through the book before I really got a feel for each girls personalities and strengths. It is also the first in a series, so there's a lot more to the story that was left hanging. Every time I tried to go back to reading and finishing this book, I was sad that I was still reading it and not something else. Even for a lower-level fantasy book, it was just flat. I also felt bad for poor Galric because every time I saw his name, I thought it was Garlic and that's just not fair.